(NaturalNews) So-called "chemtrail" technology, or the deliberate spraying of our skies with tiny particulate matter, is outlined in a new scientific study as a possible way to help reflect sunlight back into space and stop "global warming." 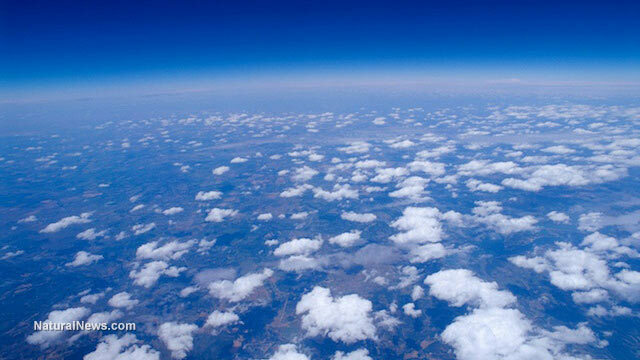 Researchers from the University of Manchester claim they've come up with an energy-efficient way to create more and denser clouds, which they say will block natural sunlight from reaching the earth's surface and promote a cooling effect, or so the theory goes. Published in the journal Philosophical Transactions of the Royal Society A, the study explains how blasting the skies with tiny "salt" particles could increase the albedo of clouds, or the amount of sunlight they reflect back into space. Since clouds already form when tiny particles in the sky naturally collect water droplets, scientists believe they can add even more particles to generate new clouds. This process, as described in the paper, sounds exactly like what many are already observing in the skies today. "The marine cloud brightening method involves using large numbers of ships to spray nebulized sea water into rising air below a marine boundary layer cloud," reads the study. "The resulting increased cloud condensation nucleus (CCN) concentrations mean that cloud droplet concentrations are increased, which has been hypothesized to result in clouds that are more reflective and longer lasting." Though the paper describes ships as the chosen vehicles for spraying these salt particles into the sky, airplanes are the much more likely mode of transfer. Chemtrail "streamers" from airplanes have, in fact, already been observed by people all across the world dating back to the early 1990s. "Over the past twenty years experiments have been conducted on weather modification, particularly on the effects of seeding clouds with such minerals as silver iodide crystals," admits a NASA report which was published in 1966. "[A] number of government agencies have been developing plans for research and ultimately operational programs in weather and climate modification," it adds, noting that scientists had already developed a way to alter precipitation by up to 20 percent, as well as reduce incidences of lightning. As you will clearly see, the idea of spreading particles throughout the atmosphere to alter weather patterns is hardly some harebrained conspiracy theory. Based on the admissions made in this 1966 report, as well as new studies like this latest one out of the UK, it is clear that weather modification is a conspiracy fact that the general public needs to finally acknowledge. The obvious assumption in this latest paper is that aerosol spraying hasn't yet begun but is only being proposed as a potential option. But considerable evidence shows that stratospheric aerosol geoengineering is already taking place -- and has been for many years. "There is a mountain of scientific data to confirm the reality of 'global dimming,'" explains the chemtrail resource Geoengineering Watch.